Oregon homebirth midwives have a very serious problem. A recent analysis prepared by Judith Rooks, CNM (a homebirth supporter) showed that for a baby alive at the start of labor, homebirth increased the risk of death by 800%. That required action on the part of homebirth advocates. No, silly, not tightening requirements for the education and training of homebirth midwives. How about restricting their scope of practice? Are you nuts? Just because babies are dying left and right at Oregon homebirths is not reason to interfere with the income stream of homebirth supporters. 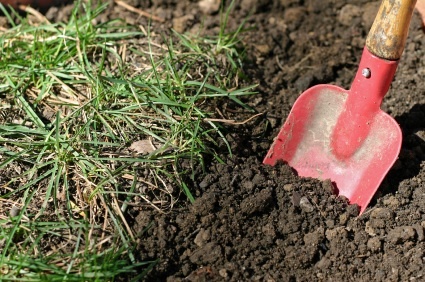 Instead, homebirth partisans have moved to bury dead homebirth babies twice. First they buried them in pathetically tiny coffins. 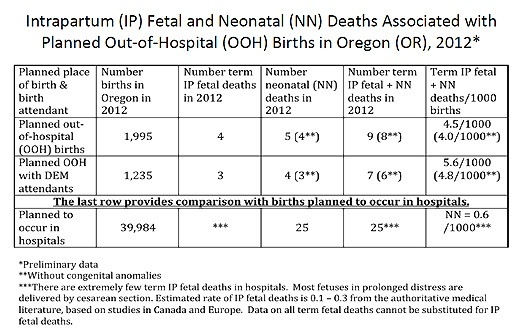 Now they are burying them in report about homebirth that includes a blizzard of numbers, all the numbers EXCEPT the most important one, the death rate of babies who started labor alive. You can find the unabridge document here. It is 7 complete pages and includes a variety of pages, but search for any mention of “death rate” and you will find there is NOT A SINGLE MENTION of the deaths rates. Why does that sound familiar? Maybe it’s because it’s just like the most recent report from Colorado homebirth midwives that ALSO neglected to mention the death rates. Maybe because it’s strikingly reminiscent of MANA’s decision to publicly proclaim the C-section rate, intervention rate, transfer rate, prematurity rate, and many other rates, and in a striking coincidence, they ALSO neglected to mention the death rates. It’s almost if there is a conspiracy among homebirth midwives and their supporters to hide the death toll of homebirth from American women!! The abridged version tries another tactic: adding in stillbirths to dramatically soften the impact of the homebirth deaths. The term perinatal mortality rate§ for planned out-of-hospital births (4.0/1,000 pregnancies) was nearly twice that of in- hospital births (2.1/1,000). The folks at the Oregon Department of Health should be ashamed of themselves for agreeing to participate in a patently unethical whitewash. The fact remains (even if they won’t include it) that for babies alive at the start of labor homebirth increases the risk of death by 800%. That is an appalling number, only slightly less appalling than the fact that homebirth partisans are desperate to hide the number by any means at their disposal. Homebirth kills babies. Homebirth midwives and their partisans KNOW that homebirth kills babies and they are doing everything they possibly can to hide that information from American women. When it comes to homebirth midwives, their lack of ethics is nearly as appalling as their lack of education and skill. … or move to Hawai. I can’t believe the temerity of the woman. She will never learn, she actually believes herself to be just as much of a victim as baby Shazhad. And more of a victim than Margarita who ‘persecuted’ her. Why can’t these people just teach yoga or some such Eat-Pray-Love-finding-myself activity? Why must they get involved in delivering babies. And persecuted indeed. She is a piece of work. I suppose I’m being meen now, too? Yoga requires effort as well as some training so as not to injure oneself. Knitting and/or “holding space” normally does not. Too bad we didn’t know this when Dr Amy was there, THAT would be a meeting I would like to see. Of the 8 out-of-hospital birth deaths, 6 of them did not meet low risk criteria for out-of-hospital birth (including twins, postdates and morbid obesity). Hmmm… variation of normal or high risk? Either way, their babies are dead. Dead is a variation of normal. Of course, as a Certified Hamster Midwife, I believe that eating your placenta and then eating your baby is normal, so take what I say with a grain of millet. If I read the original data correctly: 2,021 planned homebirths and 39,990 hospital births. So 3.04 times more neonatal deaths in the planned home birth group. I am confused. I thought perinatal mortality was the statistic that was the most meaningful comparison? What am missing? Perinatal mortality is the gold standard for international comparisons. However, if you are looking specifically at the effect of place of birth, the best measure is outcomes for babies who were alive at the start of labor (intrapartum still births+neonatal deaths). That’s the best way to judge the impact of giving birth far from expert assistance. Perinatal deaths can be caused by many things, some of which are unpreventable, like severe birth defects, sudden placental abruption, or complications of prematurity. Intrapartum deaths (DURING labor) of normal babies should pretty much never happen if there is decent medical care available. If the state allows this, will it open then up to lawsuits when some mom loses a baby and said they relied on THIS for informed consent? Oregon is already being sued over a severe CP outcome. The information isn’t missing. They just aren’t advertising it. Their AIC. Ridiculous. If you want a HB, fine, but you NEED the FACTS before you do it. This is ensuring no one gets them. I feel for any parent who loses a child – I cannot imagine a heartache that would be worse – except losing a child and then finding out that providers and the government knew that homebirth increased the risk of death but willfully with held that information from those who were making a decision about where to give birth. It’s an outrageous betrayal layered on top of an incredibly heart breaking loss – frankly, it strikes me as breaching a duty owed to those parents, the duty to provide informed consent. I could use this tactic if I wanted to argue against mandatory car seats for kids. Sure kids who aren’t restrained have a risk of dying in a car crash that is many times that of the risk of a restrained kid. But HEY, I hope the following distracts you!! Look over here—-> Car crashes aren’t the only sort of important accident. Drowning and gunshots and getting strangled in the min-blinds are also important! Also cancer is an important cause of childhood mortality! If you look at ALL of these causes of mortality (and I’m betting I can fool you into doing so), your un-restrained child doesn’t have a many-multiples risk of dying in childhood compared to a restrained kid, now he has only a double risk. See, not so bad. I’ve diluted it down, and it’s so much more palatable. Strapping your kid in won’t prevent cancer after all, so what’s the point? 2/1000 seems like such a low number, until you realize that my child’s elementary school is 500 kids. Which one would you like to erase before they even draw breath? Right. I always remember that my high school class was 400. For “small” risks like 1/100, that’s four people just dropping dead. I believe that would cause a stir. Yeah, but these babies don’t “drop dead”. They are “born still, peacefully sleeping”. That’s so much nicer, don’t you think? Football two-a-days practice stopped because of a rare child dying at these practices. Yet Homebirth continues. 22 kids in my class in high school. 1.1 mothers unable to breastfeed. Planned OOH births have a higher rate of stillbirths, since they think all babies “know” when to be born. Yeah, but at least it’s not a 800% greater risk. So even though it’s a worse rate they can still use it to dilute down the 800% number. Slick how that works, isn’t it? So does that mean the hospital born babies were smarter? No, they got pulled out before they were ready by evil, evil OBs worried about silly things like them not-dying. After all why would you want to sacrifice your OOH birth so that you could have timely induction? Me and my adorable little timely induction (who just turned three) would like to dedicate this birthday to Cervadil.